Documents reveal coordinated effort by Colorado-based Energy Fuels Resources and Utah lawmakers to push U.S. energy security in urging lands be removed from Bears Ears. (Courtesy of Tim Peterson | LightHawk) Red Canyon, west of Cedar Mesa in southern Utah, was once a busy uranium mining district. The Bureau of Land Management is now considering an expansion for the idled Daneros Mine, located in Bullseye Canyon, pictured in the middle distance of this aerial photograph. Colorado-based Energy Fuels Resources wants to extract 500,000 tons of uranium ore over 20 years from the mine, located on the edge of the former Bears Ears National Monument. The company asked the Trump administration to scale back the monument, claiming it jeopardized its operations. Energy extraction on public lands had a lot more to do with Utah’s national monument reductions than the Department of Interior and the state’s elected leaders are acknowledging, newly disclosed documents suggest. According to a May 25 letter obtained by The Washington Post, Utah’s primary uranium producer and waste processor, Colorado-based Energy Fuels Resources (EFR), implored Interior officials to trim Bears Ears National Monument in ways that protect its assets just outside the monument’s periphery, which included the country’s last operating uranium mill. The company apparently feared that having a national monument abutting the mill located at southern Utah’s White Mesa — which features a sprawling network of wastewater ponds — would hurt its operations, putting at risk the nation’s domestic ore-processing capacity. “Reducing our reliance on foreign sources of uranium requires a facility that can process the abundant uranium resources that are located in the region near the White Mesa mill,” wrote Energy Fuels’ chief operating officer, Mark Chalmers. 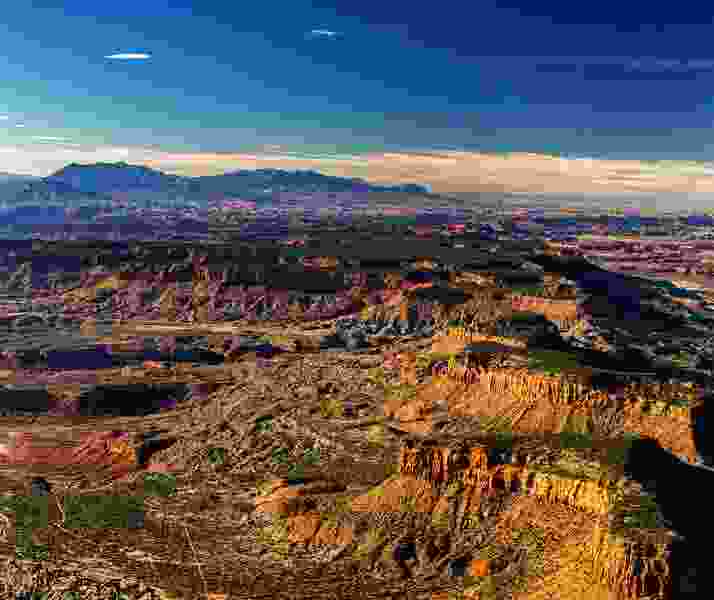 Echoing comments submitted by the Utah Legislature’s Commission for the Stewardship of Public Lands, Energy Fuels also insisted the 1.35 million-acre monument, designated a year ago by President Barack Obama at the request of five American Indian tribes, threatened national security by disrupting access to mineral deposits and complicating Energy Fuels’ operations. President Donald Trump delivered on Dec. 4 when he shrank the Bears Ears monument into a 129,980-acre sliver along Comb Ridge and renamed it Shash Jaa, following recommendations provided by Interior Secretary Ryan Zinke with the backing of Sen. Orrin Hatch, R-Utah. Trump also carved out a separate monument at Indian Creek. In his speech at the Utah Capitol, the Republican president justified his actions by arguing public land must be available for “public uses,” but he made no mention of uranium or other extractive uses. The Energy Fuels letter, submitted May 25 as part of Zinke’s review of 27 large national monuments, mirrors assertions made to Interior by the Legislature’s public lands commission. “The monument threatens the existence of the White Mesa mill, forever prevents any new mining operations within the monument, and threatens to eliminate all existing mining operations within the monument,” stated the commission’s comments, which called for a complete revocation of the monument. A month earlier, Energy Fuels had emailed Hatch’s office maps specifying which parts of the monument it wanted removed from the monument. Highlighted on the maps are two swaths: one is between the White Mesa mill on the monument’s eastern boundary, and Black Mesa, an island already excluded from the monument. The other is a slice of Fry Canyon on the monument’s west side, near Energy Fuels’ idled Daneros mine, which the company is hoping to reactivate and expand. Both the maps reflect concessions the uranium producer had already received from the Obama administration, which had excluded Red Canyon and Black Mesa from Bears Ears because of their uranium potential. The Salt Lake Tribune obtained those maps as part of a comprehensive public records request to various state agencies. Energy Fuels has also invested heavily in the lobbying services of Andrew Wheeler, a former Senate staffer now awaiting confirmation as a top deputy at the U.S. Environmental Protection Agency. According to federal lobby disclosures, the Lakewood, Colo.-based company, a subsidiary of a Canadian corporation, has paid Wheeler’s K Street firm Faegre Baker Daniels Consulting $40,000 since April. While the prospect of energy extraction hung over the monuments review since Trump launched it in April, Rep. Rob Bishop, R-Utah, and other anti-monument officials have rejected environmentalists’ assertions that access to federal minerals drove Trump’s Dec. 4 order shrinking the monuments. In an interview with The Tribune the day before Trump’s announcement, Zinke stressed he’s not concerned about a large increase in oil and gas exploration or coal mining on the public lands left out of the reduced monuments. Interior officials have also emphasized that Zinke’s recommendations came after a “robust comment period” during which Interior fielded 2.8 million online comments from residents, elected officials and the Utah Navajo. Analyses of those comments, however, found overwhelming support for leaving monuments intact, even among those submitted by Utahns. “The secretary has said all along that he is interested in giving locals a voice in the monument review process,” Interior spokeswoman Heather Swift wrote in an email. Meanwhile, the energy industry, Congressional Western Caucus and the Utah public lands commission have also weighed in, pointing to Bears Ears’ oil and gas and uranium potential as a rationale for rescinding the monument. Yet Zinke has continually framed the monument reduction as a way to correct past presidential abuses of the Antiquities Act and ensure public access. “This is not about energy. There is no oil and gas assets. There is no mine within the Bears Ears monument before or after, so the argument that President Trump stole land is false, nefarious and a lie,” Zinke told reporters in a Dec. 5 press call. While hydrocarbons are scarce on Cedar Mesa, there are plenty of abandoned mines and existing mining claims that Energy Fuels appears to be interested in pursuing should uranium prices rebound. Both the state public lands commission and Energy Fuels pointed out that the U.S. gets only 6 percent of its uranium, used to fuel power plants, from domestic sources. In its comments, the state commission added gold and oil and gas to the list of mineral riches found at Bears Ears. On the west side of the monument, Energy Fuels was worried about the monument boundary sitting less than two miles from its idled Daneros Mine in Red Canyon. Seven miles of the mine’s only access road crossed the monument to reach State Route 95. Chalmers noted in his letter that an ongoing environmental review of Energy Fuels’ proposed Daneros expansion has been held up as the Bureau of Land Management explored how future operations would affect the new national monument. A 60-mile truck trip across the monument separates the mine and the mill at White Mesa. Reporter Thomas Burr contributed to this report.